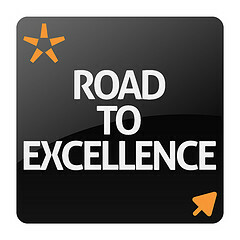 Excellence is a talent or quality which is unusually good and surpasses ordinary standards. According to Aristotle, “we are what we repeatedly do. Excellence, therefore, is not an act, but a habit.” Old habits are hard to break and new habits are difficult to form. Habits can either benefit or hurt the goals you set for yourself. How are your habits? Do they help you reach your goals? Habits are routines of behavior that are repeated regularly and tend to occur subconsciously. Excellence may be a habit, but you have to work at it! Excellence needs practice. In sports, music, professions and academics, you need to practice to achieve excellence. It takes years to achieve excellence and a lot of practice. In sports, Olympic or professional levels define excellence. Music or academics requires years of practice to achieve excellence. Formation – How do you form a habit? It should be easy, you just do something for twenty-one days (21) days straight and it is a habit. If it were truly that easy, all of us would be excellent. To form excellent habits, you have to find excellence and repeat it. Look for people around you who do excellent work and you will notice something about them. Successful people do the right thing every time. Do what they do repeatedly until it becomes a habit. Practice – If you every played basketball, you know you did not start out shooting the ball like Michael Jordan. Michael Jordan did not start out like Michael Jordan. He was cut from his high school (varsity) basketball team in his sophomore year. In other words, he spent some more time on the junior varsity. He needed some more seasoning or practice. Of course, we know he came back and became the greatest basketball player of all time. He practiced after practice and worked harder than anyone else to become excellent. Preparation – Practice is not enough! You have to compete with the best people you can find in your organization. It could be a team sport, famous musician or just someone who you want to emulate. How do you know when you are excellent? In other words, when do you know you achieved excellence? It takes a long time; some may say it takes 10,000 hours or years. It takes years of practice and preparation for the big game. Motivation – You have to be a self starter! Your boss may demand excellence, but you have to do the work to make it happen. It starts a long time ago when you were young. You excel in school, sports or extra-curricular activities. Somewhere you learned what it took to be excellent at something and you continue to do it. You learned to give your all to something and saw the reward of hard work. Take that motivation to everything you do! It is hard to develop habits of excellence if you never experienced it. Successful people control their circumstances while others do not. Do you accept your circumstances or plan, practice and do something great with your life? If people like Michael Jordan and Tiger Woods will practice until they are great, you can too. Form habits and practice until you achieve excellence. Achieving excellence requires action! You have to form or change habits to achieve excellence. Practice until you form habits that you can rely on to achieve excellence. You have to challenge yourself to reach to new levels by competing with other excellent performers. This takes self motivation and reflecting on your performance to reach for new heights. Excellence is a habit not a single act!